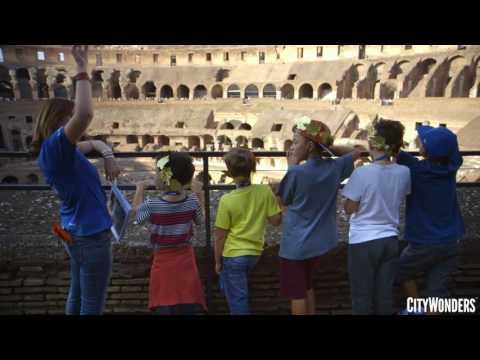 Designed to excite and spark imaginations, Rome's one and only 2-hour Colosseum tour engages the whole family. Using role-playing, re-enactments, visuals, challenges and props, your friendly guide brings the history of emperors, gladiators, lions and battles to life. This unique tour has been tailored by a childhood education specialist for families with children ages 7–12. Skip the long entrance lines and jump right into history brought to life through role-playing, visuals, challenges, and props as you are guided through the gladiator arena and the Roman Forum. Listen to your expert guide enthusiastically narrate stories and anecdotes about the brave gladiators who fought here and the emperors who ruled them. See both parents and children encouraged to participate and ask questions in the open and interactive environment. This is the perfect way to cater to your kids' interests and energy levels while having an enjoyable time yourself. End teh tour with a deliciuos gelato to reward the kids! Children aged under 18 must be accompanied by a parent or legal guardian. If some of the venues are closed, your guide will provide a thorough explanation from the outside and offer an extended tour of the Colosseum instead. Our guide was sweet and friendly but there seemed to be either a lack of knowledge or perhaps practice working with kids. I was disappointed that we walked away from the tour without much more knowledge about the Colosseum. My child loved it. She remembered the information she learned from this tour throughout our trip in Rome. Great experience. This was not a family engaging tour. The worst tour I've ever been on and such a shame as the venue was amazing!